Railroad Empire shutdown a long time ago now. Several times a month I get a question, is Railroad Empire ever coming back? I feel comfortable telling everyone that the answer is yes. I have recently been working on a new version of Railroad Empire. In 2013, after I shut down Railroad Empire, I started a new business with my mom called EHR Tutor, an Electronic Health record for students in the medical field to learn how to use electronic health records. That business has grown every year for the last three years and now I work on it full time as the Director of Technology. That business has kept me very busy, but I have been finding time to work on Railroad Empire again. So the question on everyone's mind is, what is the new Railroad Empire going to look like? Well, the one thing I can tell you for sure is that, it will be truly multi-player. Players will be able to play by themselves or directly against other Railroad Empire players on the same map at the same time. You will be competing for the limited resources on the map against other players. The graphics will be similar to what they were before but, there will be some improvements. The game will require a modern browser (Chrome, Safari, Firefox, Edge or IE 11). I have a long way to go and I can't give you a release date but, I can tell you that I will keep everyone informed of the progress. First I want to apologize for the constant change in plans to what is going to happen to Railroad Empire. I have tried to keep the game going, however with this Facebook change coming up next week there is not much I can do. Facebook on Dec. 5 will be blocking any games that use Facebook features other than basic user information (Login, email, Birthday) outside of the Facebook Canvas. Also they are requiring you to split your app ids between Canvas and non-canvas (which means if people try to access from non-canvas they wouldn't get their game.) This technical change by Facebook would cause a ton of required technical changes in the game that would result in a very negative impact on the user experience. When you add that to the fact that I still haven't finished the subscription code yet, the mixed feedback I have received about the subscription code, and the fact that the game is currently costing me money out of my pocket every week, it all adds up to the end of Railroad Empire. Someday I would like to build the new version of Railroad Empire that solves all these problems and a whole lot more. I have tons of ideas that were never implemented. When the game goes off-line which will happen on the 4th of December, I will keep the blog, so keep subscribed to the blog and if and when I decide to build the New and better Railroad Empire you all will be the first to know. After talking to some people and doing some math, We are going to try and keep Railroad Empire running as a subscription service. Since there needs to be free access to the game to keep the Google Maps implementation, there will be a free tier to the game still. So here is what I am planning. The game as it stands today can be played by anyone with up to 10 trains. If you want to play more than 10 trains, You will have to subscribe. The subscription fee will be $2.50 / month or $25 / year. Facebook will only have the monthly option at the moment because that is all their subscription system supports. When you subscribe you will no longer need to use Board Points. There are still some things I need to work out about how all this will work and I have to write a bunch of code to support this, but I plan to try and do this quickly. As long as we can get enough subscribers to offset the cost of running the game, the game will continue to run. As always I look forward to hearing your comments, thoughts and concerns. I have thoroughly enjoyed working on Railroad Empire for the past 2 years. We launched Railroad Empire to the public two years ago. There have been some ups and downs as I have worked to try and make Railroad Empire better, but unfortunately Railroad Empire is costing me a lot of money and I am losing money every month. It is not fair for my family to continue to bear this burden, so I am writing this letter. Right now unless we change something I will have to shutdown Railroad Empire on September 30th. I don't want to do this, but right now the game brings in an average of $260 a month and the total cost right now is about $560 a month. I am currently paying the extra $300 a month out of my own pocket. Many of you may be wondering how I ended up in this state. I attribute it to two mistakes on my part. The first is that when I designed the game I chose to use the virtual currency monetization method. At the beginning of the game's history this proved to be a very effective method of monetizing the game, however as the percentage of users changed from new users to veteran players the revenues dropped off and the cost increased slightly as veteran players have more trains which costs more to run the game. The second potential mistake I made is that I chose to build Railroad Empire on Google App Engine. Last year Google made a major change to its billing practices for App Engine. At the time these changes happened, I was hoping I would be able to work through the increases and control costs, however I have been unable to reduce the costs on Google App Engine. A while back I started on a project to change the backend for the game from Google App Engine to a traditional server architecture. However I substantially underestimated the amount of work that would be involved in the project and I also have realized that it may not have a substantial impact on the cost. In addition there are some features of Google App Engine that would be lost in the transition. There are also some issues with user accounts from users logging in through Google, Yahoo, and other OpenID providers. Right now the game gets 7863 unique players a month. So if people are interested we can explore moving the game to a subscription model. This creates a potential issue in that Google Maps requires an app that is not freely available to pay for a Premier license which is $17500 a year. We may be able to switch the map software to something else but I am not sure how difficult that will be. I had a great time running trains and checking things out at the National Train show in Grand Rapids Michigan. Here are some pictures I took at the show. 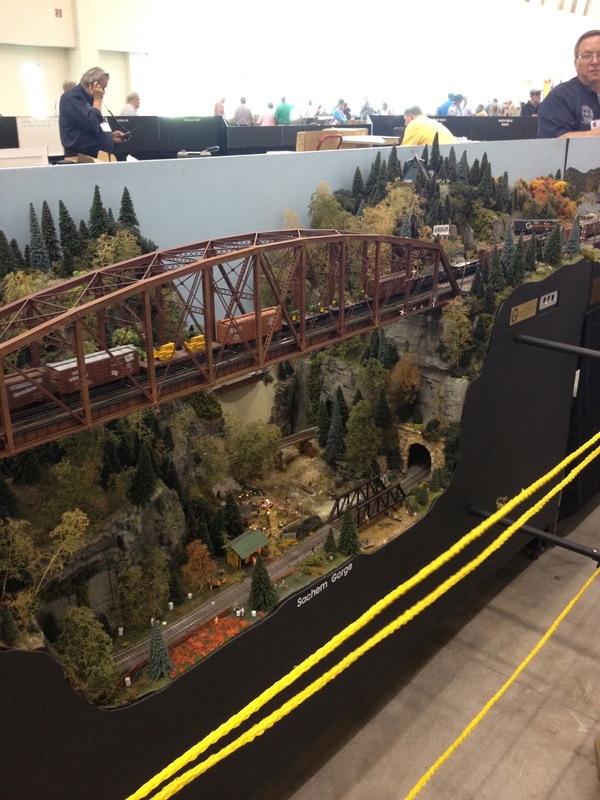 This is an awesome Lego Trains Display at the show. A very nice passenger terminal in HO scale. 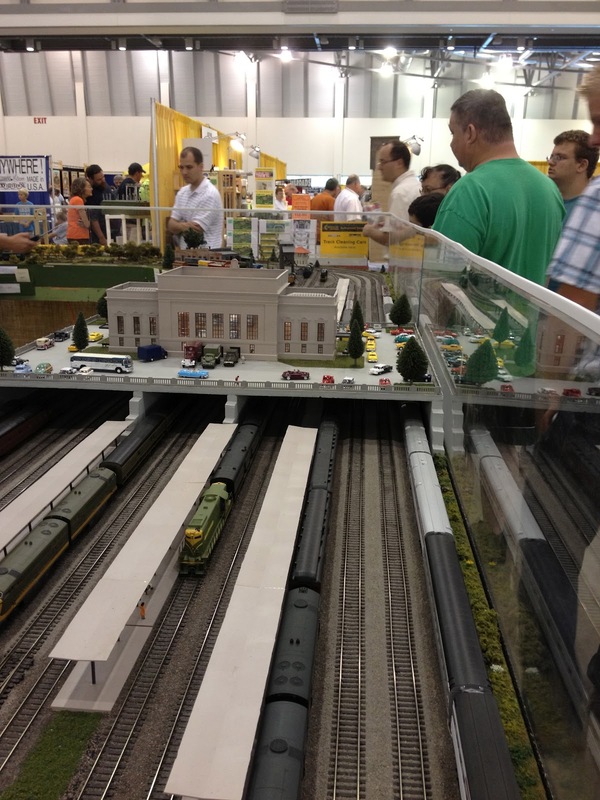 I just got done helping set up the IHMD layout for the National Train Shown in Grand Rapids Michigan. 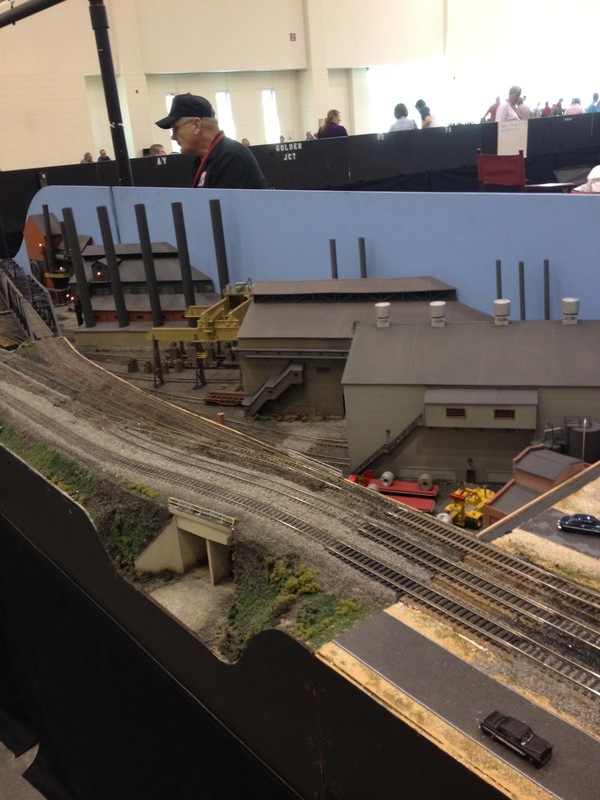 I'll be here all weekend running trains at the 3 rail O guage layout in the southwest corner of the Devos Center. I'll post pictures from the show next week. If you are at the show feel free to stop by and say hi. Hello Everyone, A couple of quick notes before I talk about the new engines in the game. Over the last few weeks the game was plagued by a couple of problems. First we had a lot of issues with overdue trains, then we began having a lot of performance issues. I have been working hard to address both issues, and each time I think I have the problems solved they seem to come back. I am not going to say whether or not they are fixed because every time I say they are fixed, they seem to come back. The GE AC4400CW is a 4,400 horsepower (3,300 kW) diesel-electric locomotive that was built by GE Transportation Systems between 1993 and 2004. It is similar to the Dash 9-44CW, but features AC traction motors instead of DC, with a separate inverter per motor. 2,598 examples of this locomotive were produced for North American railroads. As a result of more stringent emissions requirements that came into effect in the United States on January 1, 2005, the AC4400CW has been replaced by the GE ES44AC. As of 2005, every Class I railroad with the exceptions of Norfolk Southern and Canadian National owns at least one AC4400CW. These units quickly gained a reputation as powerful freight haulers, especially in heavy-haul applications. The AC4400CW was the first GE locomotive to offer an optional self-steering truck design, intended to increase adhesion and reduce wear on the railhead. This option was specified by Canadian Pacific, Cartier Railway, CSX, Ferromex, Ferrosur, and KCS. The EMD GP40 is a 4-axle diesel-electric road switcher locomotive built by General Motors Electro-Motive Division between November 1965 and December 1971. The locomotive's power is provided by an EMD 645E3 16-cylinder engine which generates 3,000 horsepower (2.2 MW). The GP40 had a longer frame than the similar but less powerful GP35, and distinguished from it visually by having three full-sized radiator fans at the rear of the long hood, whereas the GP35 has two large fans and a smaller one in between. The difference in length is distinguished by the GP40 having one more handrail stanchion (ten) along the long hood than the GP35. 1,187 GP40s were built for U.S. railroads, 16 were built for Canadian railroads, and 18 were built for Mexican railroads. Various passenger versions were also built. In 1972, the GP40 was discontinued and replaced by the GP40-2, which has an improved electrical system and a few minor exterior cosmetic changes.